Twenty years ago, when William and Carol Thibadeau gifted Emory’s Michael C. Carlos Museum with an unusual collection of art from the ancient Americas, it was accompanied by a mystery. 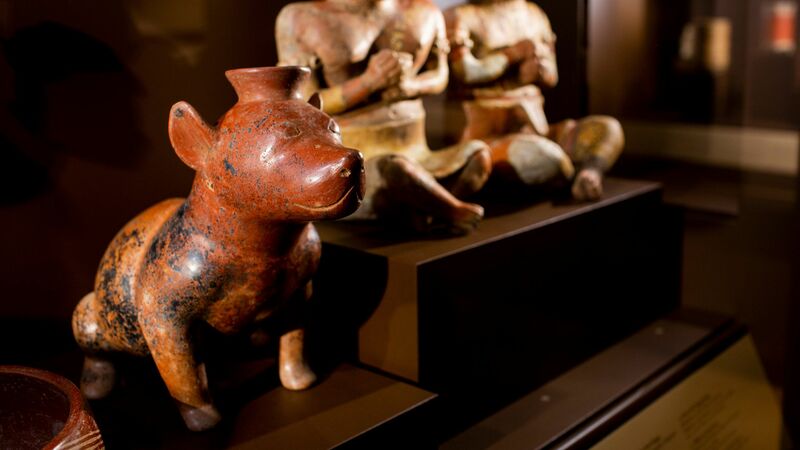 Were the exquisite figures and vessels genuine pre-Hispanic artifacts or simply very good forgeries? Throughout their mid-century travels, the Atlanta couple had amassed hundreds of pieces of art representing the early cultures of Mesoamerica, including West Mexico, as well as Central America, Panama, the Northern Andes and South America. While there was little doubt about the authenticity of pieces from Central and South America, the objects from West Mexico told a different story. It was an important story, to be sure. 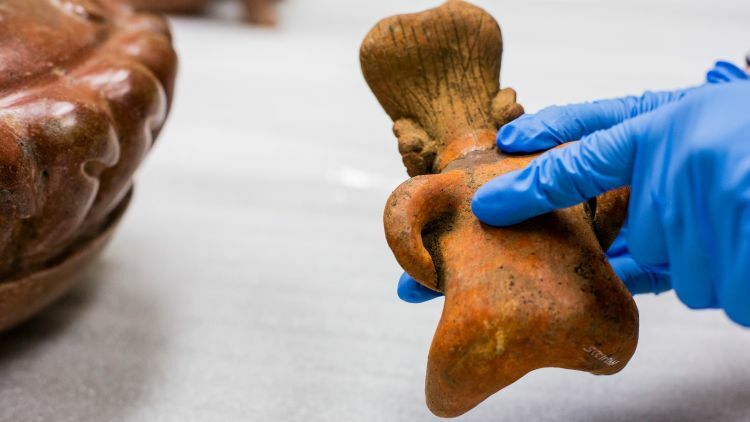 If authentic, the pieces promised an invaluable glimpse into a culture long shrouded in mystery that had thrived almost 1,500 years before the Aztecs. Within the couple’s collection were dozens of West Mexican ceramics that had likely been found in subterranean shaft tombs — among a variety of “grave goods” traditionally placed near bodies in underground burial chambers. Residue and wear patterns suggest the vessels had once been filled with food and drink, perhaps to accompany the departed along their journey. Artfully rendered, the compact figures depicted humans and animals engaged in everyday activities, vividly capturing a time and place. 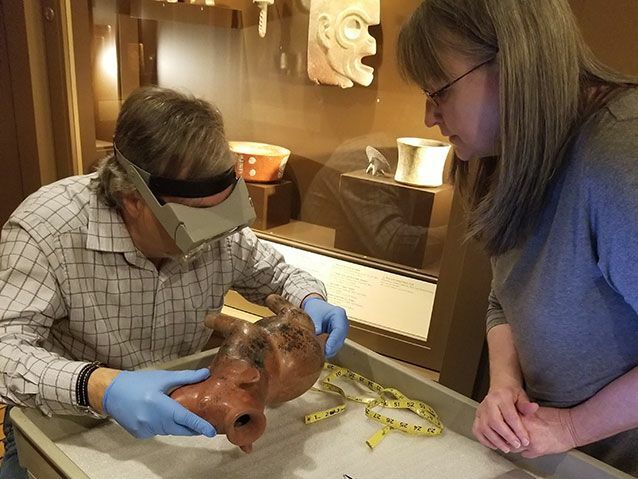 “We don’t have their stories preserved through texts, but we do have stories told in objects,” says Rebecca Stone, art history professor and faculty curator of the Art of the Americas collection at the Carlos Museum. Across the past century, the artifacts proved enormously popular with collectors, leading to the creation of high-quality forgeries that could often fool even the most experienced eye. Authenticating them remains a widespread challenge, Stone notes. 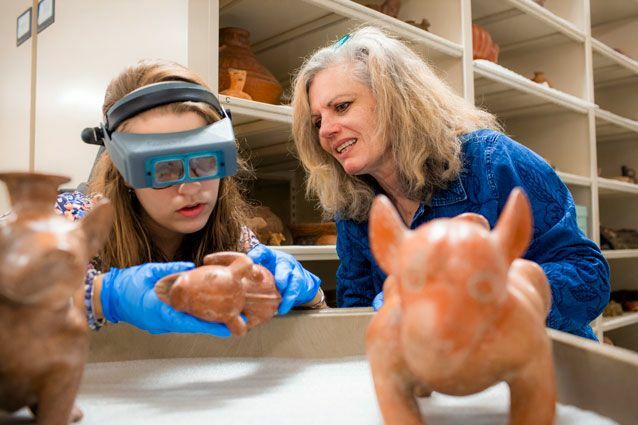 But for a museum rooted in an academic research community, which uses its collections for teaching, Stone knew the pieces could provide more than vibrant examples of the art of ancient Mesoamerica. If legitimate, each ceramic promised a virtual library of information, a tangible history lesson in pre-Hispanic cultures that could fit in your palm. 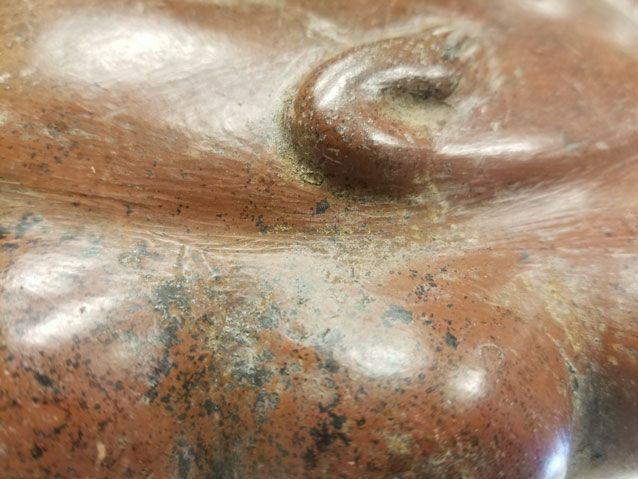 Seeking answers, Stone invited Robert Pickering, a professor of anthropology at the University of Tulsa and experienced forensic anthropologist, to campus this past semester to speak about his pioneering approach to studying ancient ceramics — and perhaps help solve the mystery. 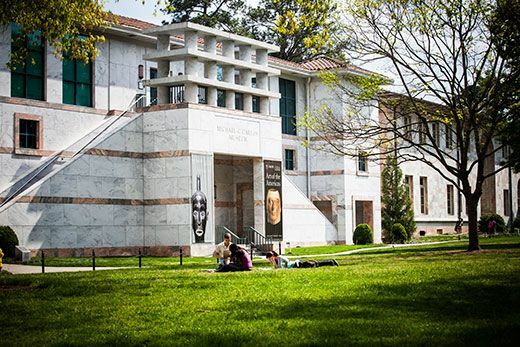 During a visit supported by the Andrew W. Mellon Object-Centered Curatorial Research program, Pickering and his team, including Cheryl Smallwood-Roberts and Julia Forester-Sellers, worked alongside Emory scholars to examine more than 100 West Mexican ceramics in the museum’s Mesoamerica collection, a majority of which have never been displayed. Employing a technique that draws from forensic anthropology, biology, entomology and medical science, Pickering scrutinized the contours of each burial vessel, even using an endoscope —a medical instrument more commonly used on a human esophagus or colon — to peer inside. Pickering had stumbled upon this method in 1995 while exploring an undisturbed tomb located 20 feet below a construction site west of Guadalajara. There, he examined the remains of six adults surrounded by personal adornments and traditional ceramic grave goods from a site excavated by Mexican archeologists Jorge Ramos de la Vegas and Lorenza Lopez Mestas. Encrusted upon the surface of each object, Pickering noted the subtle, raised contours of tiny oval forms. Resembling flat, microscopic barnacles or blemishes, some of the ovals seemed to be divided into segments. In time, he hypothesized that the markings “were probably the remnants of insect puparia — the ‘casks’ that house pupating insects between the larval and adult stages,” Pickering wrote in an article published in American Scientist. “Not to be impolite, but where you have dead people, you have bugs,” he explains. Once inside the tombs, the insects lived out their life cycles, laying eggs whose larva would eventually migrate away from their food source to pupate on the ceramic vessels and hatch, their lingering casings creating a distinctive texture. Later, examining other West Mexican ceramics, Pickering would find evidence of the same ovoids, ranging in size from no larger than the head of a pin to several millimeters long. An entomologist would help confirm his suspicions, marking a breakthrough discovery. Up until then, the primary means of establishing the antiquity of West Mexican ceramics relied primarily upon the observations of archaeologists, dealers and collectors regarding style, artistry and subject matter. Archaeologists had also long documented the presence of dark splotches and stains from manganese and iron deposits — a phenomenon that expert forgers eventually learned to replicate by flicking black paint on the ceramics. 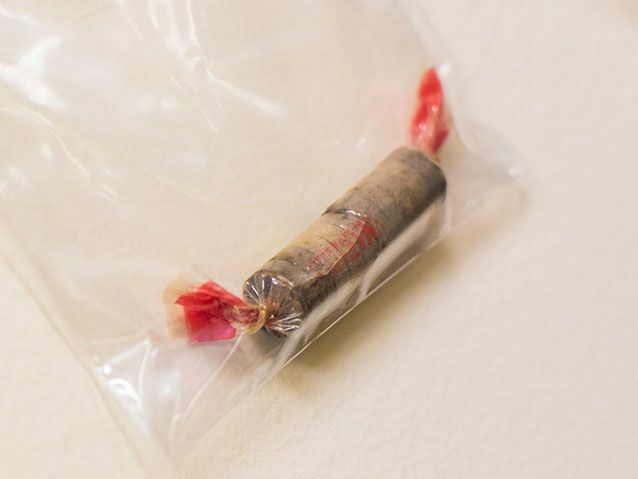 But bug casings? That was new information, unknown to both archaeologists and forgers. A third-year PhD student in art history, Elizabeth Caris came to Emory’s Laney Graduate School to study the art of the ancient Americas with a particular interest in pre-Hispanic Andean ceramics. “I had already done some fieldwork in high school, and knew early on that I was interested in the dirt and studying the cultures of, well, mainly dead people,” says Caris, a 2018 Andrew W. Mellon Fellow and former curatorial assistant at the Carlos Museum. Despite little background with West Mexican antiquities, she seized the chance to learn more. When Stone arranged for Pickering’s visit, both Caris and Stone hoped he could offer answers. After examining the only five pieces currently on display — they passed with flying colors — the team moved on to a satellite storage location, where the vast majority of the collection has been held for 20 years. Splayed across a tabletop, many of the pieces look deceptively similar. But magnifying glasses and Pickering’s endoscope revealed tiny, textural clues. There were surprises, too. Deep within a ceramic figure,Pickering delicately extracted a strange, decaying tube, later determined to be a roll of Smarties candy. More significantly, dirt extracted from another vessel was dated back to 400 BC — two centuries earlier than the dating of other West Mexican ceramics. What&apos;s inside? Peering into the hollow ceramic objects, researchers found markers of antiquity in some — plus a decayed but decidedly not-ancient roll of Smarties candy in one. Standing before a table in the museum’s storage building, Stone cradles a female figure in her gloved hand. She draws attention to the surface of the ceramic, which glows bright orange, rather than a traditional burnished amber hue — surely the sign of a forgery. But just below a shoulder, Stone locates the unmistakable blemish of an insect casing. “Imagine, we might not have given her the time of day,” she says, smiling. 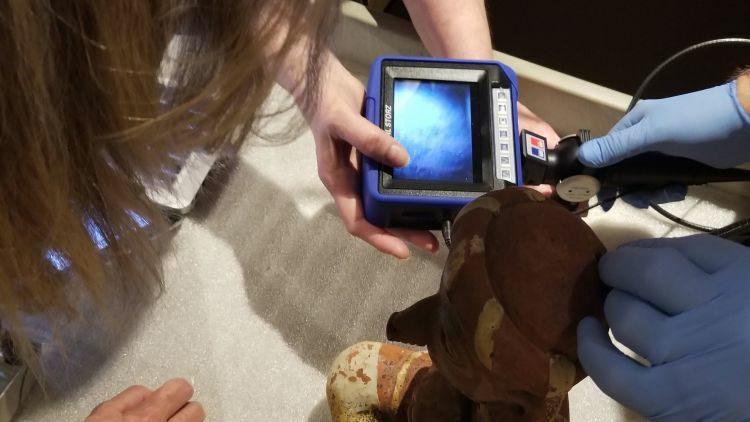 Using casings and verifiable manganese deposits, the team located indicators of antiquity on one-third of the West Mexican collection, which totals just over 100 objects. Yet surprisingly, a few that seemed glaringly different also bear the casings — exciting new information that will help expand both scholarship and future exhibits, Stone notes. 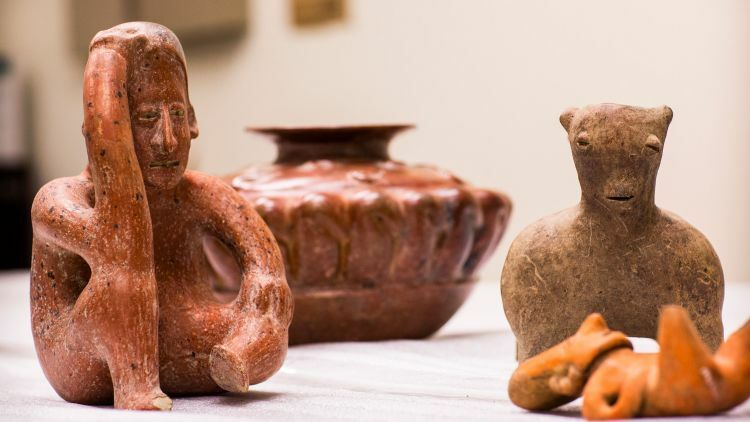 Data about the ceramics (more than 70 variables for each piece) was also collected for a larger national database representing some 1,500 West Mexican ceramics, which will help enrich future scholarship. Once trained in the technique, Caris was thrilled to have a hands-on opportunity to examine the pieces herself, a scholarly exercise in hide-and-seek. About this story: Writing by Kimber Williams; photos by Ann Borden unless otherwise noted. 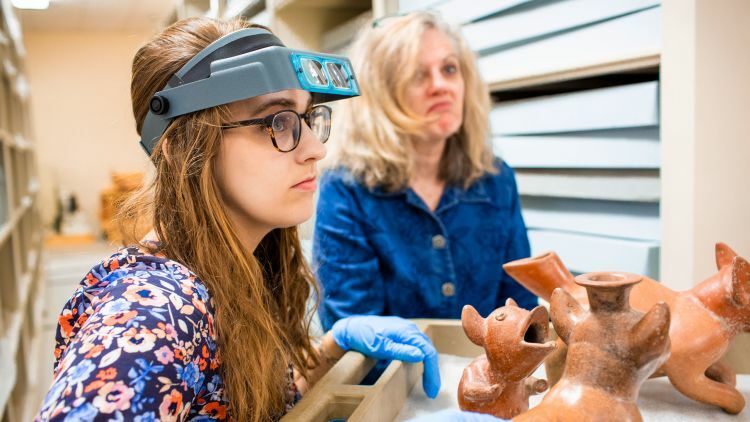 PhD student Elizabeth Caris and Rebecca Stone, faculty curator for the Carlos Museum&apos;s Art of the Americas collection, examine West Mexican ceramics held in a campus storage facility, working to identify authentic pieces. 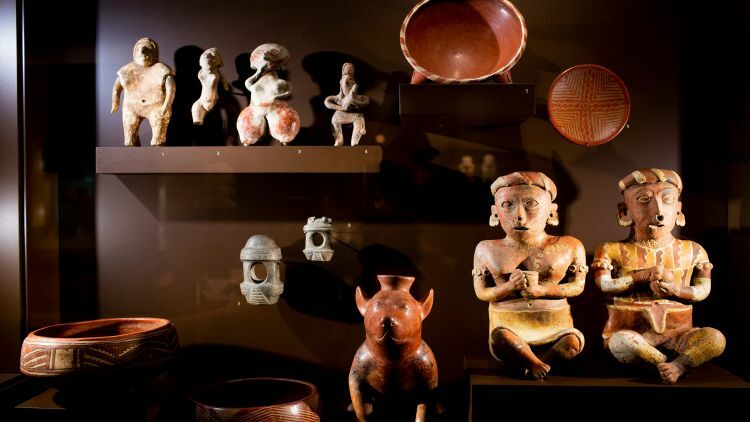 The Michael C. Carlos Museum’s Art of the Ancient Americas gallery, which opened in September 2002, houses one of the most important collections of such art in the Southeast and one of the nation’s key collections of art from ancient Costa Rica. Crafted from a variety of natural materials, the pieces reflect the cultures of the Maya, Aztec and Inca, among other ancient American cultures, and are heavily used in teaching. More than 2,000 high-resolution images of works of art within the Carlos Museum&apos;s collections are available online. View the museum&apos;s hours and admission.